How The Fragrant Hand got its name. In May 2016 I suffered a ruptured brain aneurysm, I survived and I'm alive which is its own special miracle. The way I see it, I'm living on bonus time and I intend to make the most of it! Post rupture, my brain isn't what it used to be. I'm still smart, I'm still me... but I spend a lot of time spinning my wheels trying to remember what I'm doing, feeling confused and finding my place again. Things take me longer and I can't multi-task the way I used to. I care for my adult autistic son who is in constant need of attention, so whatever I'm doing, I'm also answering his queries and comments. So that's already two tabs open in my brain at any given time - one tab more than I can really handle. I thought I'd try to share a week in my kitchen life. Share the adaptations I've found for getting food on the table in my house. Instant Pot - I'm not going to teach you to use an Instant Pot or which one to buy. There are tons of resources out there. I will share some of my favorites with you and I'll link recipes when possible. I have always liked to cook and I like to understand WHY things work and HOW they work. 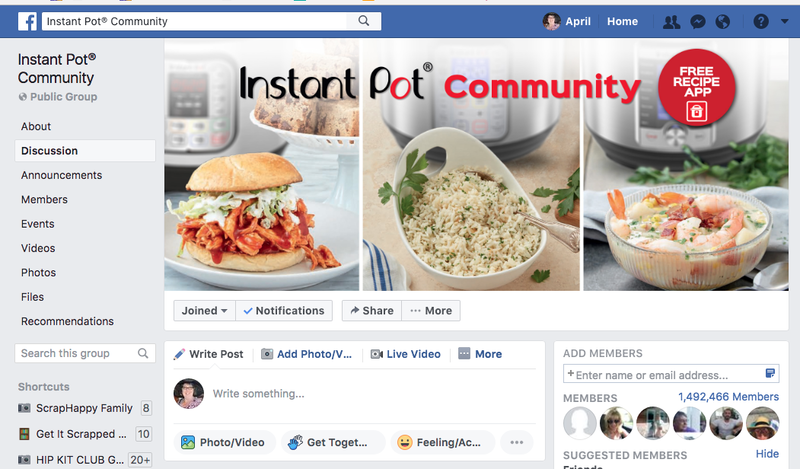 I've heard from a lot of people who used to hate to cook that the Instant Pot has changed their life. It's changed mine too. I always liked to cook and now it's even easier. https://www.hippressurecooking.com Laura Pazzaglia is a Pressure Cooking Expert. 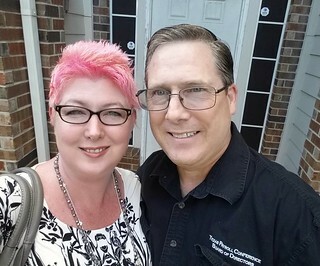 She has been an advisor and consultant to several Pressure cooking companies and has even helped develop some of the recipe books that come with them. Her website is a TROVE of pressure cooking info with tables for cook times, news about what's new in pressure cooking, recipes, and don't miss her YouTube series Pressure Cooking School. https://www.facebook.com/groups/InstantPotCommunity/ Instant Pot (brand) Facebook Community - be sure to read the participation rules and search the group to see if your question has already been answered (it probably has been discussed in detail and if you you'll have an instant answer). Here's how to search a Facebook group. See that magnifying glass icon at the top of the image with the F to the left of it. You search there to search ALL of Facebook to find groups or people. Once you belong to a Facebook Group (it only seems to work for groups) If you look down the left hand column you'll see the magnifying icon again and it says "search this group" that is where you can do a search to look for specific information within the group. This is the way it looks on a computer, if you are using a mobile device it will look different, but once you know to look for it, you can find the search in group field. Sunday night I got home from a 2 week trip out-of-state. On Monday I needed to get the dishwasher emptied (load of dishes I ran before I left) and the sink of rinsed dirty silverware & dishes my husband used while I was gone into the dishwasher and running. I had done a quick market run Sunday night and replenished a few staple perishables. While I cleaned the kitchen I got a batch of hard-boiled eggs going for my son to eat as snacks during the week. I began with this old gal's recipe for instant pot hard boiled eggs and I have adapted it a bit. You will see all kinds of directions for how to do this. I think it must have to do with your specific machine (electric pressure cooker) and the size of eggs you use. I'll link to This Old Gal's recipe https://thisoldgal.com/pressure-cooker-easy-hard-boiled-eggs/ and tell you how I do it. But I don't have the brain capacity to trouble shoot a bunch of what if and how to questions. There are bloggers and Facebook groups that are much better equipped than I, to cover that. Pressure-cooked eggs peel so easily the day you cook them. When I hard boil eggs in my Instant Pot I place the trivet that came with the pot in the bottom. I fill the pot with 1.5 cups of water (the minimum amount my pot is supposed to need to come up to pressure according to the instructions that came with my pot). I have a steamer basket that came with a stove-top pressure cooker years ago and I place my eggs in that steamer basket and set it on the trivet (Amazon is full of options for steamer baskets and egg racks and This Old Gal even has links to ones that she particularly likes). I place 10 large eggs in the basket. Seal the lid and close the steam valve. I set my pot for manual setting - I verify that it is set to High Pressure and set the time to 3 minutes (that's how long the eggs will cook once the pot comes to pressure and the pressure indicator pops up. When the cook time is complete the pot will beep and turn itself off. I a set a timer for an additional 7 minutes to allow the eggs to continue cooking as the pot cools down. After 7 minutes I release the pressure. I remove the eggs from the pot with tongs rap them each once on the counter to break the shell and plunge them into a bath of ice and water to stop the cooking. There they sit until they are cool enough to peel usually 30 minutes or more. If I notice all the ice has melted, I add more ice. When the eggs or cool, or I get to the stage of cleaning my kitchen where I have freshly scrubbed my sink, I peel the eggs under running water. 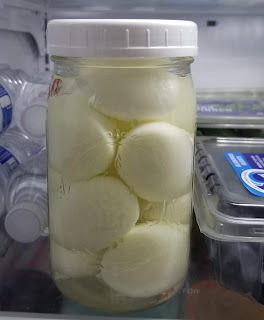 I store the peeled eggs in a mason jar with water to cover the eggs in my refrigerator. The sulphur from the eggs will continue to leach into the water, you can change to fresh water after a day or two if you like. Meanwhile I started to unpack, saved a baby bird from my puppy out in the yard. Locked the dog inside so the baby bird could recover, tried to build a ladder out of chicken wire so the baby bird could return to the tree. Filled my son's pill container with his vitamins and medications for the week. 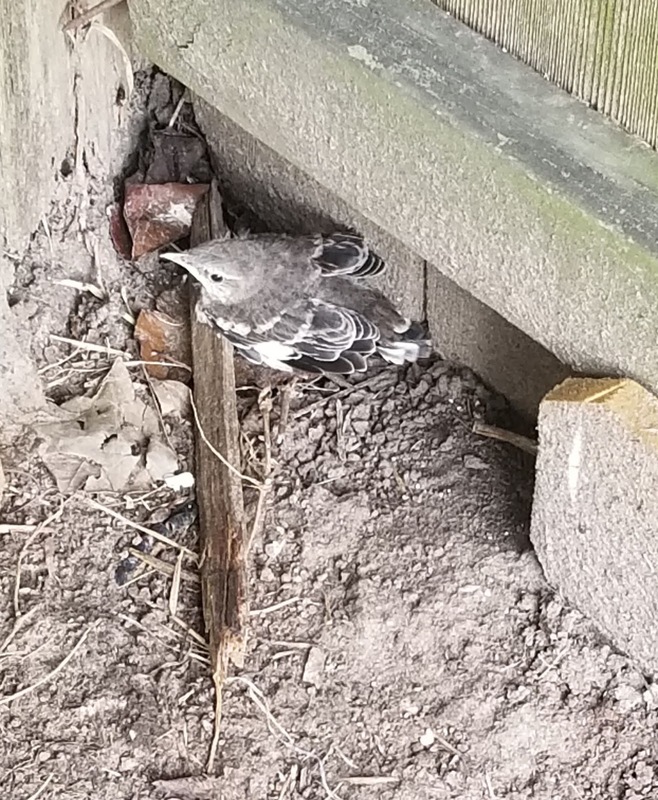 I Continued to take the dog out on a leash all day so she wouldn't eat the baby bird. I also unboxed a printer that I ordered for my craft room back in February (I had been waiting until after the new window installation to set it up). I got the printer onto the cart, installed all the ink and began the initial set-up while dinner cooked. I'm sure there were other things, but that's what I remember. Here is what I made for dinner. I cooked a pot of basmati rice on the stovetop (I probably could have done it in my instant pot while the chicken cooked, but I forgot). I made Butter Chicken out of a cookbook. I used chicken thighs and I ended up blending it in my blender because I have the 8 quart instant pot and the sauce wasn't deep enough in the pot so my stick blender was splattering everywhere. I used butter and whipping cream because I had purchased them to use in the recipe but next time I will try using the suggested alternatives of coconut oil and canned coconut milk as these are both things I have in my pantry. Dinner took much longer to make because I had to search my whole spice cupboard for all the spices. When I got ready to cook, I realized that I had been looking at the wrong recipe. My ingredient list was much shorter, but somehow this detour took me about 45 minutes because my brain was in a confused state. As a result it was quarter to 8 when we sat down to eat dinner, but everyone agreed this recipe is a keeper. 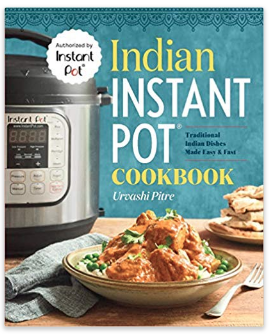 The recipe is in this cookbook, which I accidentally bought for Kindle (usually I buy physical copies of cookbooks) but when I realized my error I decided to try it on Kindle (and my Ipad) and see how I like it. My crockpot got broken and I was without one for about a year, during that time I got out of the habit of using it. Now that I am recovering from brain surgery and have limited energy I am even more motivated to find crockpot recipes I love. I began with this recipe that I found on Pinterest http://www.couponingtodisney.com/kristins-kitchen-beef-tips-and-rice/ I first made it at the cabin where I have a limited pantry and I was surprised how good it was with so few ingredients. I've now tweaked it to my own liking and this is my definitive version. I like to use 2 lbs of steak tips because I want leftovers. 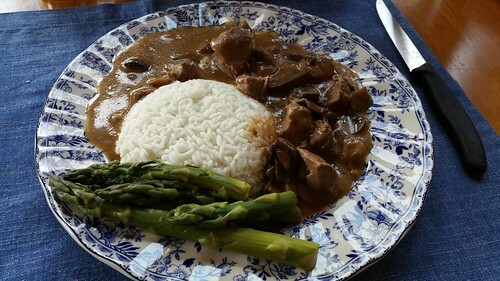 I serve it over rice because it reminds me of my mother's stroganoff and we ate that with rice. It would also be good with egg noodles, mashed potatoes or maybe orzo. I did try it with powdered french onion soup mix, I think it came out better with the canned version, there is a caramelized onion flavor the powdered mix does not achieve, but if it saves you a trip to the store you could use it. Place steak tips in the bottom of the crock. Place garlic on top of steak tips. Mix together all the soups and mushrooms and pour over the top of the steak tips. This step can be done at the beginning or later & added to the crock at any point in the cooking. If for example you need to get to an appointment first in the morning but will have time later in the day. Dump in the mushrooms and spread out into a single layer. Let them brown on one side for 5 to 8 minutes then jumble them about and let the second side do the same. When they are brown and have begun to shrink add 1 cup of hearty burgundy and 3 whole garlic cloves to the pan. Let simmer for 10 minutes, this simmer reduces the wine and cooks off some of the alcohol if you added un-reduced alcohol to the crock it will not cook off and will not give you that lovely long simmered flavor you get from cooking with wine. Add all to the steak tips in the crock and continue cooking. Note: I am now making this dish in my Instant Pot. When I get that recipe typed up I will link it here. 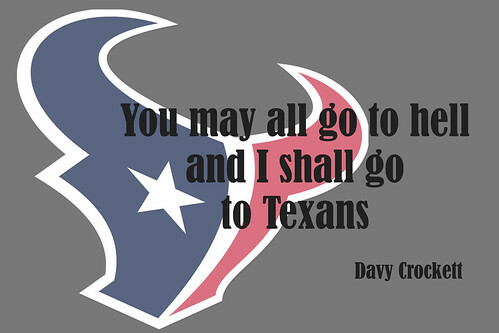 Well not quite, but that is nearly what he said. And the woman reflected that while they reveled at the game, she would indeed spend the balance of her evening in cooking hell. She put on her rooster festooned apron and rolled up her sleeves and set to work. 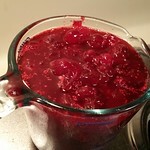 Now it so happens that the favorite holiday preparation of this particular woman was the making of fresh cranberry sauce. So she thought it a good place to begin. 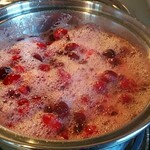 She boiled water, sugar, orange juice, and added the cranberries, those edible rubies of the holiday table. And as they bubbled and transformed, the kitchen filled with scent and the woman began to perform kitchen alchemy as her mother and grandmother had done before her and generations of women before them. 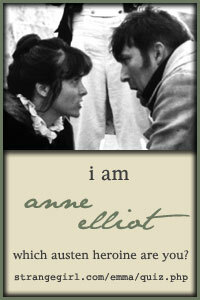 And she found in her heart that it was after all an enviable thing to be able to do. That was not to say she would not welcome dishwashers upon the morrow. 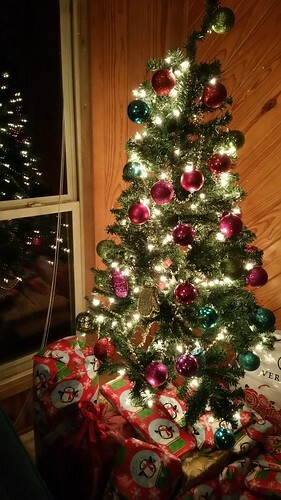 Merry Christmas and Happy Holidays dear ones. God bless us, every one! Before I talk about this page, I need to bring you up to speed. 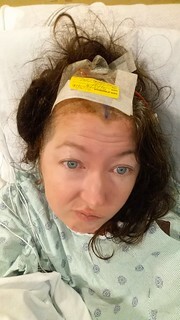 I had a brain aneurysm rupture on May 17, 2016 (4 months ago). I had 3 brain surgeries, I was in the hospital ICU for 2 weeks. Even once I came home it's been a long recovery, a road that I am still traveling. I am only beginning to feel like things are getting close to normal. My doctor told me it will probably take a year for me to get back to where I was, before. My head was shaved for the surgeries. As my hair began to grow back I was faced with a new challenge, what would my look be? Even if I grow my hair back out, it will take probably a year to get it long like it was before. I have always found that I don't "feel like me" if I trim my hair even an inch or two shorter than a certain length. I knew I couldn't spend a year not feeling like me, so it was time to re-define who I am. I decided to take control of the situation, and to make it fun. It's been exciting. I've moved my boundaries, I'm re-writing myself. The reason I share this here, is that I look very different now than I did in the photos on this page. I anticipate that someday soon I will be making another page with the selfies I've been taking of how I look now in my recovery. I am so glad I came to peace with self-photos years ago, I think it has made it much easier to accept and even celebrate how I look, now. 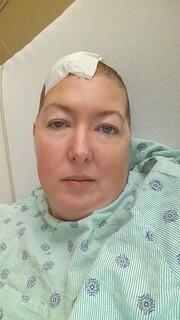 The photos are from 9 days after the aneurysm, 10th day after aneurysm which was also the day after the final surgery, and 4 months after the aneurysm. This is another of my favorite pages, it's about one of my soapbox subjects... mothers who don't appear in any of their family photos. This is a page from last year's October Layout A Day we had a pirate theme. The prompt was to make a page about something that you do that others think is annoying and explain why it's not. I thought to myself "Well I'll never do THAT one." And then IMMEDIATELY I thought "Here is my chance to talk about Selfies!" 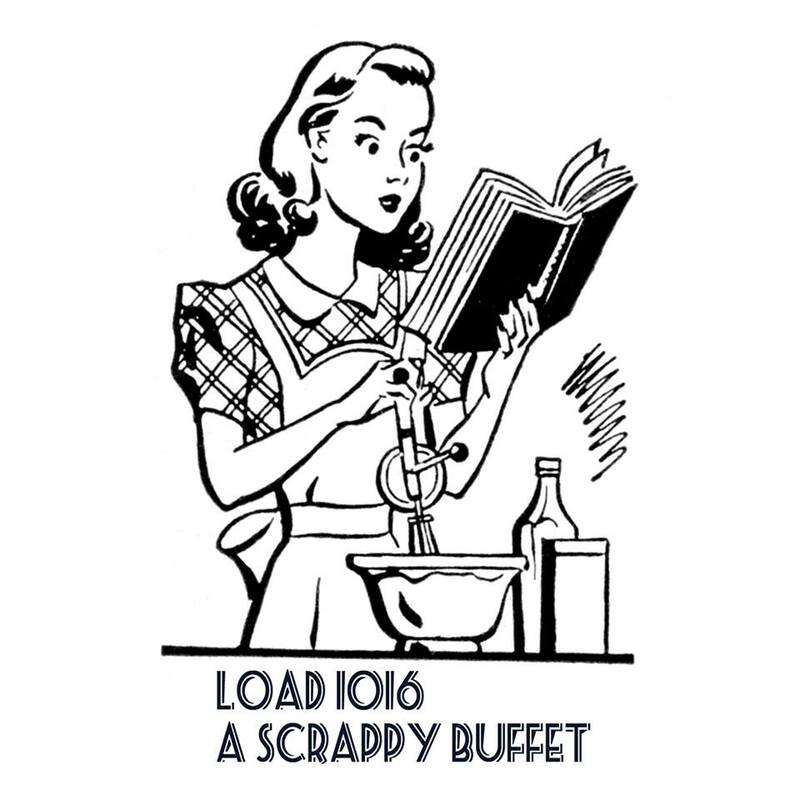 I find that LOAD is like that. Sometimes the prompts that you don't like at first, end up making the best pages! Day 13 Parrot - Tell us something that you think others find annoying about you and why they are wrong. 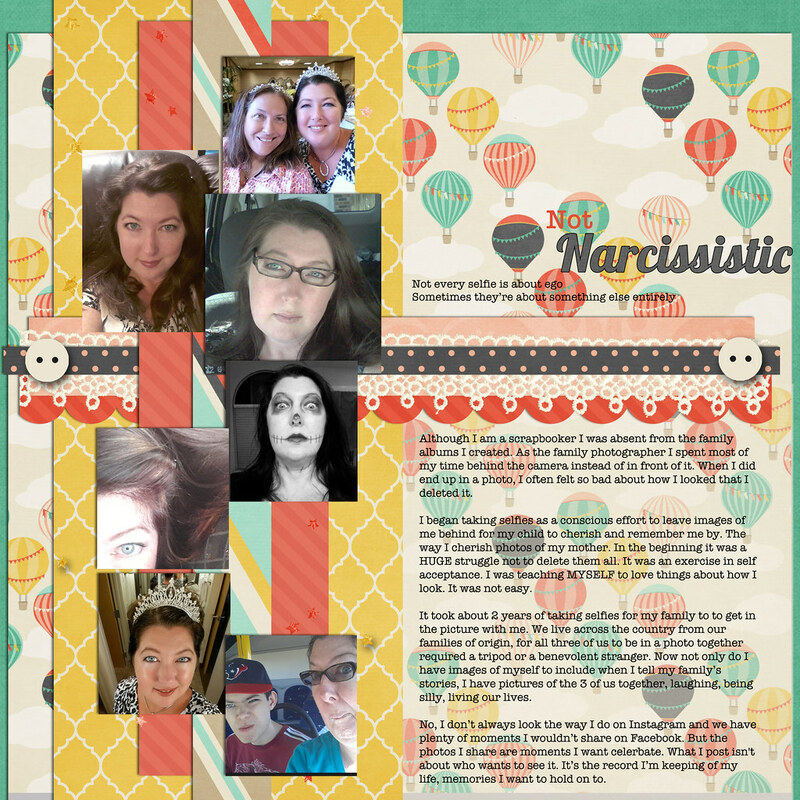 I adapted the journaling on this page from a Facebook post I had written on May 31, 2015 in response to an article which denounced the selfie as everything that is wrong with the world. 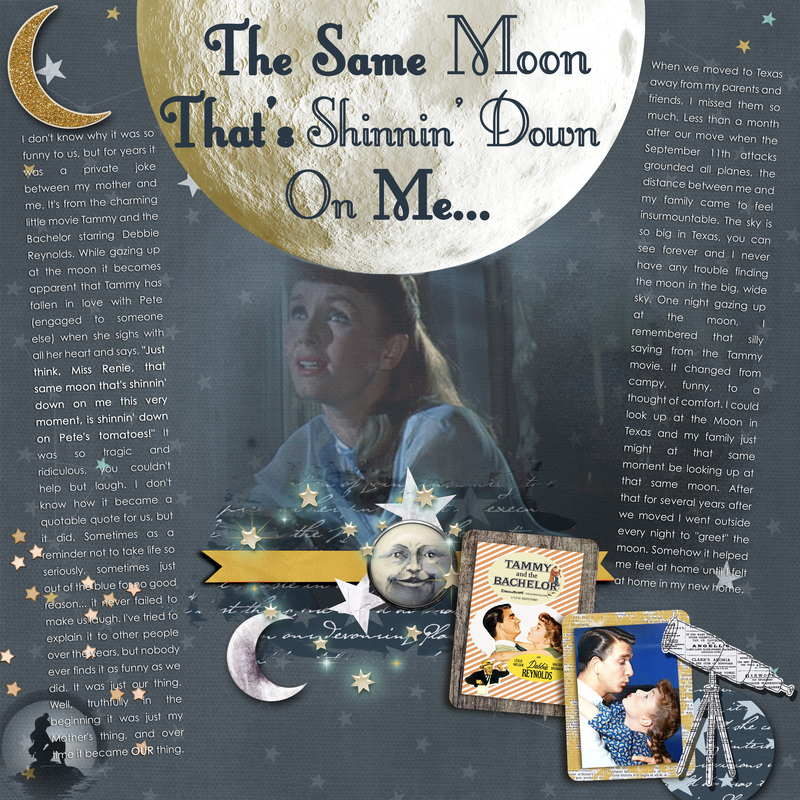 I often turn social media posts or blog posts into journaling for scrapbook pages. I struggle with writer's block when I sit down to write for a scrapbook page, I have less difficulty writing for other forums so I pull from those. Not every selfie is about ego. Sometimes they're about something else entirely. Although I am a scrapbooker I was absent from the family albums I created. As the family photographer I spent most of my time behind the camera instead of in front of it. When I did end up in a photo, I often felt so bad about how I looked that I deleted it. I began taking selfies as a conscious effort to leave images of me behind for my child to cherish and remember me by, the way I cherish photos of my mother. In the beginning it was a HUGE struggle not to delete them all. It was an exercise in self acceptance. I was teaching MYSELF to love things about how I look. It was not easy. It took about 2 years of taking selfies for my family to to get in the picture with me. We live across the country from our families of origin, for all three of us to be in a photo together required a tripod or a benevolent stranger. Now not only do I have images of myself to include when I tell my family’s stories, I have pictures of the 3 of us together, laughing, being silly, living our lives. No, I don’t always look the way I do on Instagram and we have plenty of moments I wouldn’t share on Facebook. But the photos I share are moments I want celebrate. What I post isn't about who wants to see it. It’s the record I’m keeping of my life, memories I want to hold on to. PSD template Everyday Template 1 by Cindy Schneider for Sweet Shoppe Designs part of The Daily Digi Everyday Life Collection which is a membership bonus kit. This is one of my very favorite pages, it was created back in February 2015 for Layout A Day (LOAD). Our Theme was Once Upon a Time. On this day we looked at story books where the font variety and word placement was a visual feature of the book. I figured if I was going to have a page where the words were a visual feature I would use words I like a lot so I used the story Where the Wild Things Are. I was given a copy at Ethan's baby shower and Maurice Sendak's story about a boy who can't quite contain his wildness and the mama who loves him is one of our favorites. I read it to Ethan in the rocking chair and later at bed-time. We have our own actions that we act out along with the story. There was a time I could recite it without even glancing at the book. 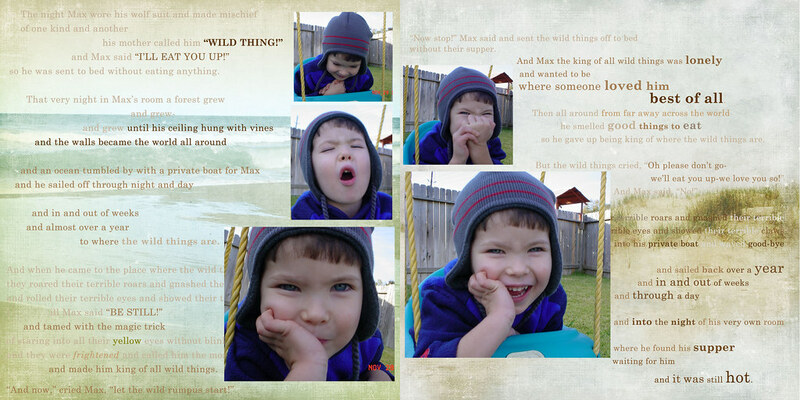 For this page I began with some favorite images from November 2002 which capture the essence of my boy, then I arranged the words of the story to flow around him. I tried to alter the spacing, size and color to mirror the way I pause and emphasize with my voice when I tell the story. I wanted to call attention to the parts of the story that are my favorites, either because of the way the words trip off the tongue, or because even though she is only mentioned once, the second half of the story is full of Max's mother who knows just what a repentant Wild Thing needs to feel secure and loved. This is the kind of often wordless bond I like to think exists between me and my own Wild Thing. On the right page I was also trying to convey the feeling that the words had been shaped by the surf, drift words. Ethan is now a senior in high school and he is more guarded about his feelings, these pages continue to be among my favorites, they capture a mood and a time that I love to recall. I think this is the first full digital page I ever made without using a template. Page created in Photoshop Elements 12. At Scrap Happy we are gearing up for another Layout a day in October. October LOAD (LayOut A Day) is always fun, it's member run and we always have a great time. 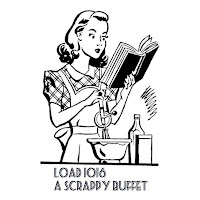 Our theme this year is A Scrappy Buffet, I can't wait to see where that theme will take us. Scrap Happy has a membership discount running right now until the end of September, just in time for new members to join us for October LOAD. I am part of a group of wonderful scrappy ladies. Scrap Happy Family, we do a layout a day challenge for a month three times a year. I have yet to make a layout each day, but I do create more than I do the rest of the year, and I have a wonderful time! Each day there is a prompt for inspiration, or you can make whatever you want. We share our pages in a private flickr gallery (optional) and it's a wonderful time of creativity, encouragement, and camaraderie. At Scrap Happy we are gearing up for another Layout a day in October. October LOAD (LayOut A Day) is always fun, it's member run and we always have a great time. Our theme this year is A Scrappy Buffet, I can't wait to see where that theme will take us. LOAD has stretched me, it encourages me to tell stories I might not otherwise have thought to tell. 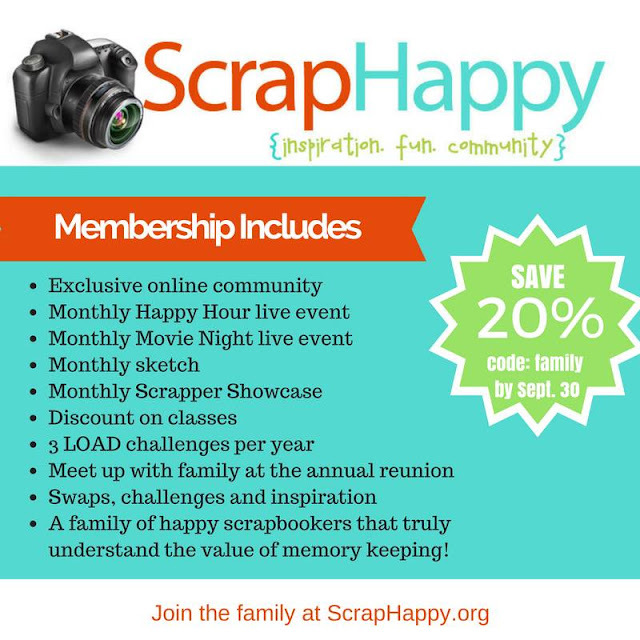 Scrap Happy has a membership discount running right now until the end of September, just in time for new members to join us for October LOAD. This is a great group of ladies, I've made wonderful friendships online and at Reunion, our annual meet-up event. Here is a favorite page of mine from a LOAD past. My favorite four walls are the fence that encloses my backyard. Journaling: My backyard is my sanctuary. It's the place I go to relax, to escape, to unwind. It's my favorite place to be. Aren't I lucky it's so close to home. Six of the photos on this page are Instagram photos, the one with the mug was my very FIRST Instagram. 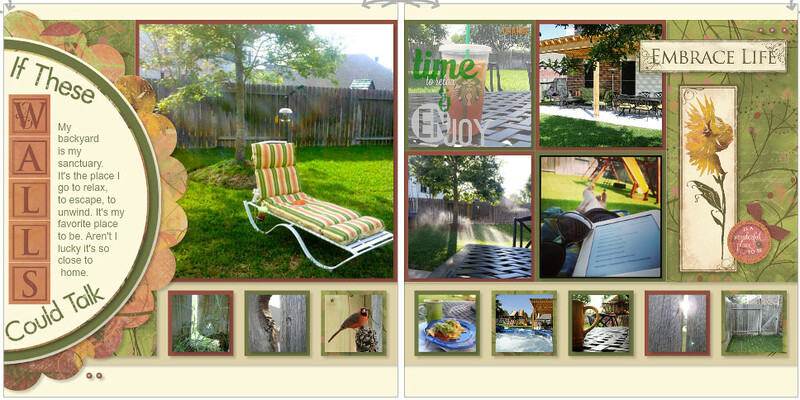 The "Time To Relax" image was edited in the Rhonna Designs App. This page was created in February 2015 as part of Layout A Day. It tells the story of how an inside joke between myself and my mother became a touchstone for family across the miles. Inspired by Load215 Goodnight Moon Challenge. Thanks to instruction by Traci Reed & Melissa Shanhun which has seriously upped my Photoshop Elements game. Cook Smart: Prep Once Cook Twice - using your freezer to advantage. In the interest of more GRACEful living in 2016 I will be bringing you a series of posts which share some of my CookSmart strategies which make it easier to get home cooked meals on the table on a regular basis. It's almost as easy to prep 2 meals in a marinade as it is to prep one. Tonight I'm making Five Spice Coconut Chicken for dinner, but I purchased double ingredients and I prepared a second batch at the same time as the first. 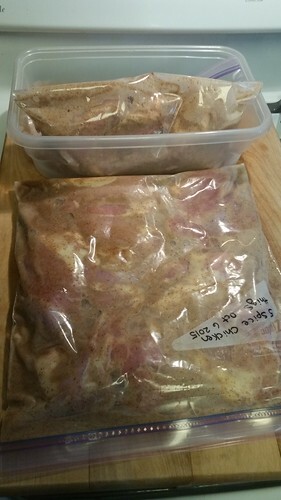 An added benefit of this method is that before the meat freezes, then again as it defrosts it is also marinating so you get very flavorful results. 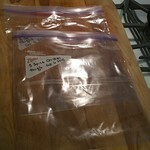 Label 2 one gallon freezer bags. 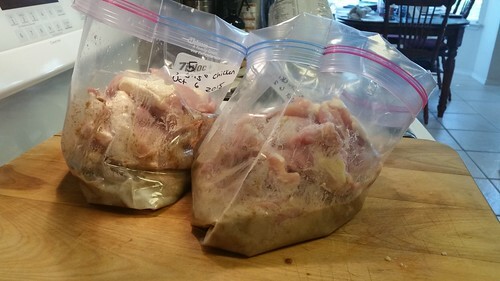 Add marinade ingredients to each bag, smoosh the bags to mix, then add chicken to each bag. Turn the bag over on itself and press out any excess air, then seal. 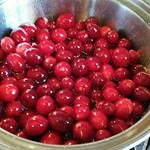 I place one in a shallow container in my refrigerator, and the second I spread out flat & freeze for a future meal. I find that things defrost more quickly when they're frozen flat this way, because they are thinner. I also measured my 9x13 baking dish and found that it's max capacity is 1 liquid gallon. 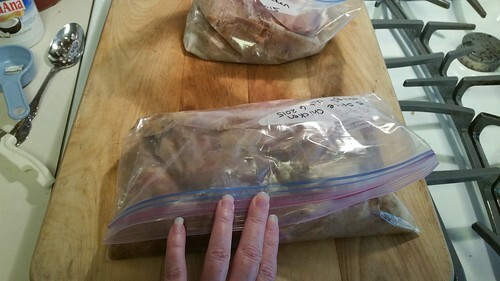 So Anything I can freeze in a one gallon bag, ought to fit into a 9x13 casserole dish for baking, this opens up all kinds of possibilities for freezer meals. I'm April, a wife and the mom of one very busy boy. I'm a recent Brain Aneurysm Survivor. 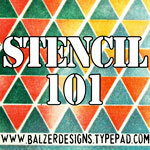 I enjoy stamping, scrapbooking, making cards and other paper crafts, and taking pictures. I love to cook. April is a participant in the Amazon Services LLC Associates Program, an affiliate advertising program designed to provide a means for sites to earn advertising fees by advertising and linking to amazon.com.